Cheese and Bacon Jalapeno Rellenos are great straight out of the oven. 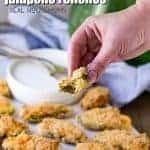 They have all the great flavor of bacon-wrapped jalapeno poppers with a crispy outside baked right in the oven! Jalapeno and bacon were a match made in Heaven!